Essential oils are one of the best-smelling, naturally antibacterial options for homemade cleaning recipes. 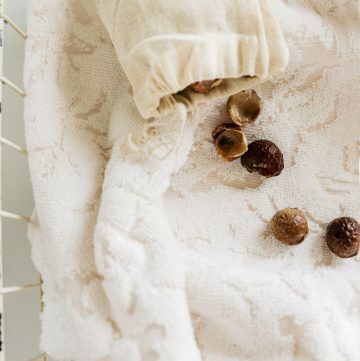 Add oils to green your laundry routine, sanitize the kitchen and nix mold in the bathroom – all while making your house smell ‘clean’ – no scary fumes needed! I’m inclined to add lemon, tea tree and lavender to just about every cleaning recipe, but there are lots more you might want to have on hand. Ready to go green for spring? Here are my 10 essential oils for cleaning. Loved for its light, clean scent, this essential oil is also a powerhouse in homemade cleaning recipes. Naturally antibacterial and antiviral, lemon is commonly used to degrease stubborn stains as well as freshen the air. Use it to deodorize your fridge, clean the floor or combine 10 drops with 1/2 cup olive oil for a natural wood or leather polish. Is there anything tea tree oil can’t do? It fights germs, bacteria and viruses in everything from homemade wipes to hand soap to daily shower spray. Tea tree oil is a handy weapon against bugs, too. Add tea tree to a spray bottle with water, shake well, and spray outside and inside the home to deter lice and other pests. Rosemary’s natural antibacterial and antiseptic properties make it a great addition to homemade dish soap and laundry detergent. 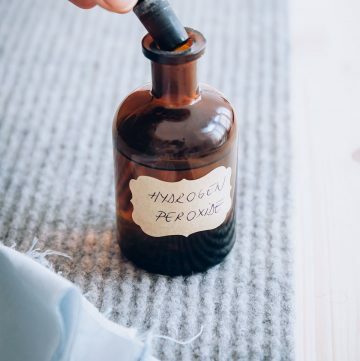 Essential oils are perfect for homemade air freshener sprays, and the combination of peppermint and rosemary is perfect when when you need to stay focused and on task. Not only does orange oil have a happy scent, but, like lemon, it’s great against grease. 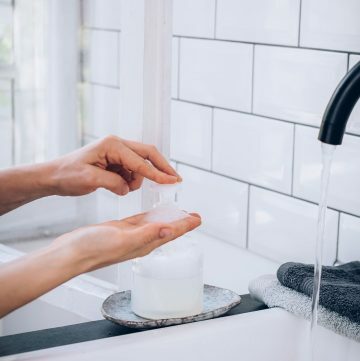 Use 1-2 drops to lift grease or glue from surfaces or combine 12 drops with 1/4 cup castile soap and water to wipe down stovetops and counters. There are tons of ways to use orange oil (we rounded up 21 uses here), including homemade fabric softener crystals, natural floor cleaner, and an energizing kitchen spray. One of the best-smelling naturally antibacterial essential oils is lavender. Lavender pairs well with another common natural cleaner, vinegar. Just add 4-5 drops of lavender to your vinegar cleaning mixture for its natural antibacterial properties – and for a more bearable scent. Harness lavender’s soothing scent in homemade dish soap and linen spray to elevate washing dishes and laundry day. This natural germicide is a powerful dust mite buster. Use it with baking soda to deep clean your mattress and in a dry wash for stuffed animals or just put a few drop in your next wash cycle. And with its clean smell, eucalyptus is great for stinky jobs in the kitchen and bathroom. Eucalyptus leaves and essential oil are great in cupboards to deter pests. There are countless uses for peppermint oil around the home. Its cool, invigorating scent and antibacterial properties make it a great addition to spray cleaners and natural deodorant spray. For an air freshener that also deters ants and spiders mix 10-15 drops of peppermint essential oil with 1 cup of water in a spray bottle. Shake well and spray along cracks and crevices or wherever ants are seen. Cinnamon is naturally antibacterial and antiseptic. Powerful against mold, it’s a great addition to homemade mold and mildew spray. Ground cinnamon and its essential oil are both effective against pests. Sprinkle the ground cinnamon anywhere that pests are seen or apply pure undiluted cinnamon essential oil to the areas with a cotton swab. Already a common ingredient in cleaners (Pine-Sol anyone?) pine oil is effective at killing yeast spores, E.coli and other household germs. Pine is perfect for ridding the bathroom of mold and mildew and cleaning hard floors while leaving a natural fresh scent. Thyme is one of the most powerful essential oil weapons against germs. Thyme is effective against salmonella so you can add it to homemade dish soap and use it to clean cutting boards that have come in contact with raw meat. Great choices! I thought it interesting as well that these are almost all the same essential oils I use topically to boost my immune system. I swipe a blend of tea tree, pine, peppermint, rosemary, geranium, eucalyptus, and cinnamon along my throat and the bridge of my nose every morning and night to keep away illness, and it works! Thanks for this list! I’ve been wanting to use more natural cleaning agents since I know the chemicals aren’t good for my dog and I.
I so appreciate this! I am new to the world of essential oils & have been researching for topical use, etc. Since I am a big clean freak, I will definitely give these a try 🙂 Thank you! I definitely stand by Tea tree oil. I like to use it for my skin. I’ve given up traditional cleaners for essential oils and will never look back. Not only are they better for our health and environment, they smell so good too! I’ve written a post on my favorite EOs and their uses here. For persistent odor in the fridge, line bottom shelf with newspaper that has been sprinkled with 10-15 drops essential oil, such as Lemon, Lime, Grapefruit, or Orange. Remove after 2 or 3 days. You can also use a slice of bread on a plate to absorb many odors. Sprinkle with 2-4 drops of essential oil of choice for extra deodorizing power. Golders Green Carpet Cleaners Ltd. I love essential oils. This is why I love your article. Thanks for sharing. Green cleaning is the only way to clean for me, and I hope more people realize it’s THE BEST. We have to care for the environment in order to care for each other. Thanks for sharing your list and tips. 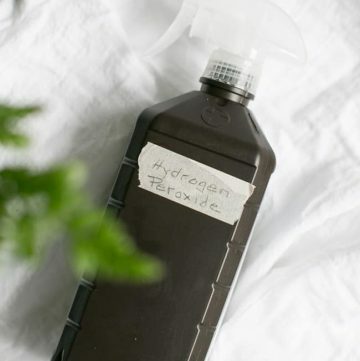 For my spring cleaning routine, I make a special all purpose cleaner that works miracles on wood floors, windows, mirrors and almost all types of surfaces. I soak the peels of one wild orange in white distilled vinegar for a couple of days. I mix 10 drops of lavender essential oil and 6 drops of lemon essential oil and add them to a solution of water, rubbing alcohol and few drops of liquid dish soap. It does a great job for quick cleanups as well as deep one off cleaning sessions. Now that I saw your handy infographic, I might try adding thyme to the mixture. That sounds lovely! Thanks for sharing Ariella! I have used orange essential oil to keep ants away!! Thoroughly wash down all kitchen surfaces, let dry, then apply a thin swipe of the oil on all surfaces, especially on window sills, doorways, and any openings such as where the counter top meet the wall. reapply after wiping down counters daily, if needed. Works like MAGIC and the whole house smells great. Using lemon is my favorite one on the list whenever I go cleaning and i also love its scent. Thank for sharing, green cleaning really rocks! I’m very new to this and excited to try! Would like to know WHERE to buy the essential oils and an estimate on the cost for them. Thanks! My family and I use lemon all the time to clean. I must try peppermint, I love its smell! This is interesting! My mom usually puts rosemary on the burner so then the whole house gets filled up with the scent! I was happy to see bottle of Finlandia vodka. Greetings from Finland! Lemon definitely has a big influence in my cleaning products, it smells so clean and new. I also have a peppermint air freshener, it smells amazing! I’m all about the citrus essential oils. Lemon, sweet orange, and grapefruit are my go-to’s, both in cleaning and otherwise! Another great one is Bergamot. It has a citrus-like fragrance, similar to orange but really lovely, and it is a less obvious fragrance than lemon which I think is sometimes a bit over-used. Really nice inforgraphic. Thanks for the tips. This is something we have been looking for ages. 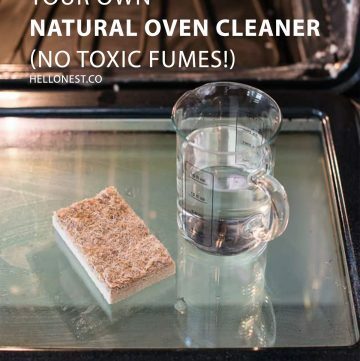 As a cleaning company, we know that some of the our clients 100% natural ways to remove oil stains. Thank you so much for sharing this. I work at a church with a daycare. Can anyone give me documentation that proves that Lemon Essential Oil cleans like a good antibacterial? Essential oils are best natural healing and cleaning. I used to get it from thrive market and aromatherapy. We just started using essential oils quite a bit, even bought a diffuser. We use lavender, tea tree, and peppermint quite a bit. Interesting! I would love to try thyme in my kitchen for next house cleaning. even though essential oils contain chemicals they are really great for cleaning. High quality oils do not contain oils. Look into doTERRA. Most of their oils are safe for consumption even. do not contain chemicals** is what I meant to say. sorry. Since starting our company we’ve found that lemon can do wonders and so many things you never thought it could. Thanks for this article, we use it to show new cleaners that we bring on our team. Very good and interesting choices. I’ve been wanting to use more natural cleaning agents since I know the chemicals aren’t good for my house and my cat. This is interesting, thank you for the information. Wow!! This article is really useful. I love essential oils but never thought they can even use this way. Totally mind blower. I will try it out for sure. Thanks for the great things. Top 10 products are reliable as it comes from nature.I always love the value from nature it is safe for the health of the user and not leave the side effects in the future. By taking the time to thoroughly clean (not just wipe over a surface) it can have a tremendous impact on the feeling and atmosphere of a property. When you walk into a home and you can smell fresh essential oils it definitely makes a difference. It takes a little bit longer to get the job done properly but it helps create inviting spaces. Hi what oils make a good antibacterial wipe to disinfect a room. Very interesting stuff! I have a bit of experience with this myself in Sydney Pressure Cleaning. Thanks for these 10 best oils. For me no 3 “ROSEMARY” is best. Thank you so much for this list and for the tips. Great article.